Amaravati: SRM Institute of Science and Technology (SRMIST), Chennai, SRM University – AP, Amaravati and Integral Coach Factory (ICF) of Indian Railways are jointly developing a Fuel cell based train prototype. The proposed fuel cell Powered Train will have Proton Exchange Membrane Fuel Cell (PEMFC) coupled with Lithium Ion Batteries and Super Capacitors. Hydrogen based PEM Fuel Cell is one of the best renewable energy sources with increasing efficiency and with zero Carbon dioxide emissions. Parallel development of Fuel cell powered switcher coach of 100 Horse Power as locomotive will be developed along with the passenger train with two coaches. Each coach of 65 Passenger capacity operating at a speed of 75 kmph. PEMFC operates at a maximum output power of approximately 30kW for switcher coach and one MW peak power and continuous power of 650 KW as a prime mover. Transient power in excess will be stored in the Lithium Ion Batteries and Supercapacitors to cater the needs of electrical requirements for the coaches. The Supercapacitors will be utilized to initiate traction for the fuel cell train due to their high and fast discharging capacity. Switcher coach may not need supercapacitors. Six Numbers of Compressed – Hydrogen Storage tanks of 0.4 meter diameter and four meter long each will be employed for the proposed Hydrogen Powered Train. Storage tank will have 60 kgs of hydrogen compressed at a pressure of 350 bars. The hydrogen tanks with all necessary safe guards will be installed below the roof of the train. In case of switcher coach, hydrogen tanks will be kept inside the coach itself. Lithium Ion Batteries and Super Capacitors will be placed below the Coach. The Fuel Cells will be stacked in one of the coaches to avoid electrical wiring and mechanical design complications. The Hydrogen Powered Train will not produce any greenhouse gases and will be less noisy than conventional trains operated by diesel or electricity. Several technical challenges will arise while designing and developing the Hydrogen Powered Train and will be overcome by the continuous efforts of ICF Engineers and SRM Faculty Members and Students. This exciting and challenging Project on switcher coach is expected to be completed by March / April 2019 and operate between loco, shell, furnishing units of ICF. The Fuel cell driven passenger train is expected to operate for public transportation by December 2019. 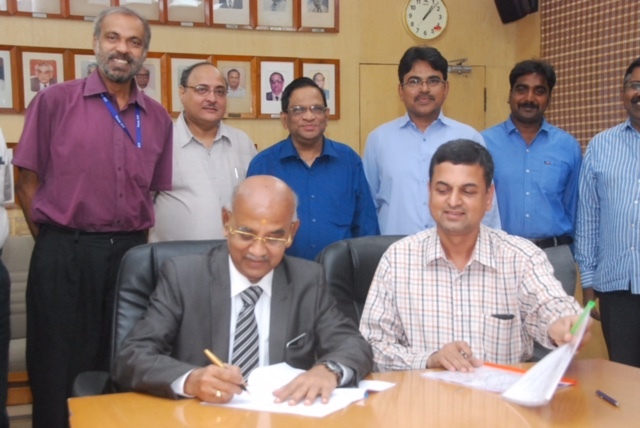 MoU has been signed on Saturday, 24th February 2018 between Integral Coach Factory (ICF) and SRMIST, Chennai and SRM University, AP – Amaravati.